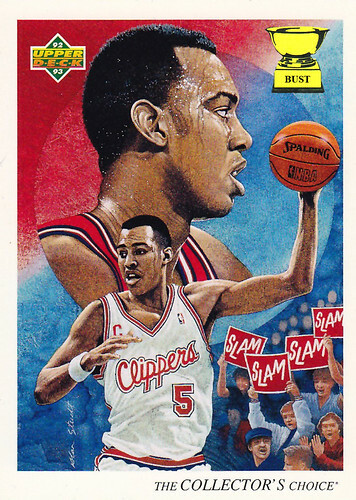 Baseball Card Bust's critique of the fine artwork on this card: The thing that strikes us right away is Danny Manning's nervousness. The reason behind this anxiety is clear. The fans at the bottom right, some of whom appear to be developmentally disabled, others of whom are wearing funny hats, are pressuring Manning to SLAM. Manning isn't sure what to make of this monosyllabic demand — he's confused and wary. The image of him at the bottom is symbolic of his inner reaction. He's holding the ball aloft, indicating his respect for the game, but he's also holding it loosely, indicating his lack of confidence in his abilities. The image of Manning at top shows his outer self: sweatier than a fat man in a Fourth of July 10K. All in all, this painting demonstrates both the importance of self-belief and the importance of SLAM. The John Wallace of Kansas.